Since they are tied to our hard-copy newsletter and monthly meetings, look for Puzzle Updates, usually on the Friday before the Second Wednesday of each Month! 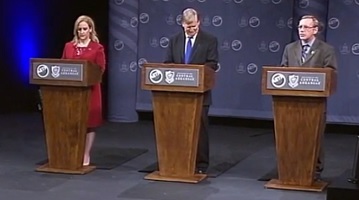 APRIL 2019 PUZZLE - "Co-ed Debates"
In the primary election, nine male and seven female candidates are running for president. Rather than have all 16 candidates try to debate at once, the League of Human Voters has decided to hold four debates, with just four candidates in each event. The debate panel foursomes are to be chosen randomly. MARCH 2019 PUZZLE - "Running the Bases"
In what base is the equation 2383 + 2473 + 2601 + 2680 = 11357 valid? And what is the sum, in Base 10? FEBRUARY 2019 PUZZLE - "Fishy Encounter"
A fish whose eyes are one meter below the surface of a river spots a boy. The boy's eyes are one meter above the surface. The horizontal distance between the boy and the fish is two meters. 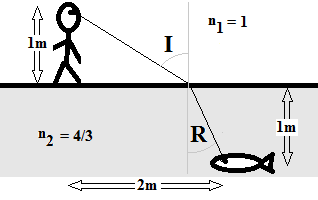 The index of refraction of air is n1 = 1, and that of water is n2 = 4/3. The February Bonus: What are the angles of incidence (I) and refraction (R)? JANUARY 2019 PUZZLE - "Clock Palindromes"
Sometimes the time of day, in hours:minutes:seconds, can be a palindrome. Examples of such palindromes include 5:29:25 and 10:33:01. Of the 86,400 seconds of a day, how many are palindromes? What is the shortest interval between two palindromes? How many palindromes come five minutes after their predecessors? DECEMBER 2018 PUZZLE - "What's the Rule?" The following words can be clearly and unambiguously separated into two distinct groups. ATOM, BOXED, CHECKBOOK, CHOICE, COCKED, DECKED, DECODE, DOCK, HOOCH, HOOKED, ICEBOX, MAXIMUM, MOUTH, OXIDE, TAXI, TIMOTHY, TOOTHY, TOYOTA, VOMIT, WAXY, WHAT, WITHOUT. 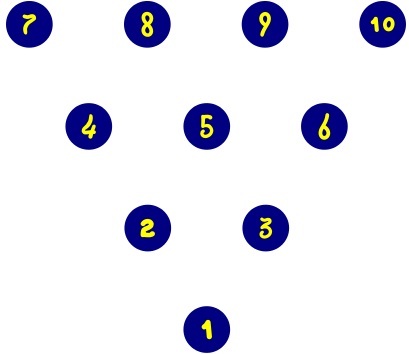 The December Bonus: What are the two groups? NOVEMBER 2018 PUZZLE - "A Stimulus / Response Enigma"
A common device with a digital keypad for data entry has a certain response for an input of 170, and twice that response for an input of 420. The first response is also the result of inputting 210, and the response is likewise doubled when 380 is used as input. The November Bonus: What is the device? And what are the two actual responses? OCTOBER 2018 PUZZLE - "What Comes Next?" Here are some values in a sequence. They appear one after the other, starting with the one on the left. The October Bonus: What comes next? SEPTEMBER 2018 PUZZLE - "Uphill is Downhill (On the Return Trip)"
A bicycling commuter can go 6 mph uphill, 8 mph on level road, and 12 mph downhill. It takes him 17 and a half minutes to get to work in the morning, and 12 and a half minutes to return home in the afternoon. The September Bonus: (A) How far is it to work? (B) On the way to work, how many more miles are spent going uphill than are spent going downhill? (C) What are the minimum and maximum values of level riding possible? AUGUST 2018 PUZZLE - "Lord of the Rings"
Samwise wants to make a friendship bracelet for Frodo, but all he has are five separate pieces of gold chain, as shown here. Gandalf has offered to cast a spell allowing one ring to be opened, and then closed, after an interval of just ten seconds. However, the wizard insists on the condition that Samwise asks him to use that spell the absolute minimum number of times. JULY 2018 PUZZLE - "Powered Ascent"
A bored convention-goer decided to deduce how many steps were found from the bottom to the top of the up escalator in the lobby. She found that by simply standing on the same step, she would ascend to the top in 35 seconds. When she walked up the moving escalator at her normal pace, however, the ascent only took 15 seconds, with a total of 23 steps climbed. 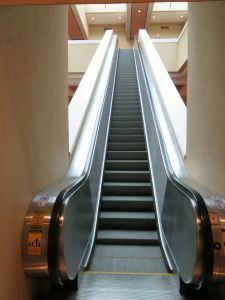 The July Bonus: If the power was switched off, and the escalator became mere stairs, how many steps is it to the top? And how long would it take our subject to make the ascent? JUNE 2018 PUZZLE - "Emoji Maths"
MAY 2018 PUZZLE - "Construction Delay"
The May Bonus: A commuter normally drives at 80 mph for an hour to reach his destination. He has found that a stretch of new construction on his route, with a strict 50 mph limit, adds nine minutes to his normal commute. The May Bonus: How long is the construction zone? APRIL 2018 PUZZLE - "Run, Fastman, Run"
The April Bonus: Two trains are approaching each other on adjacent tracks, and each is moving at 60 mph with respect to the ground. The world�s fastest man, Fastman, departs from train #1 when the two trains are 120 miles apart. When he gets to train #2, Fastman turns around instantly, and heads back toward train #1, then turns again and heads back to train #2, and so forth. This continues until the two trains meet, at which time Fastman stops. Fastman is running faster (constant speed w) than the trains (constant speed v=60mph). How fast? Your big clue is that the length of each leg in Fastman�s back-and-forth run is one quarter the length of the preceding leg. The April Bonus: How far does Fastman run altogether? MARCH 2018 PUZZLE - "Chicken Futures"
The March Bonus: You are in charge of getting fried chicken for the big party, and you have a budget of $100. Chicken is tax-free, by the way. What is the largest number of pieces you can purchase at Wally World? FEBRUARY 2018 PUZZLE - "Honest Advertising"
The February Bonus: What is the algorithm for success? JANUARY 2018 PUZZLE - "Inner Balance"
The January Bonus:You have a balance, and need to be able to verify any weight from 1 through 121 grams, to the nearest gram. You have a given number of unique fixed weights (called A, B, C, D, � for convenience). You need to be able to weigh unknowns for two different modes of using your balance: Mode #1, in which only the unknown weight is on one scale, and Mode #2, in which some of the fixed weights can also be on the same scale as the unknown. The January Bonus: What is the minimum number of weights, and what are their values, for Mode #1? For Mode #2? DECEMBER 2017 PUZZLE - "Tug of War"
Two strong individuals are playing Tug-of-War with a very long, very strong, and very light-weight rope. The two players are strong enough to keep the rope taut, no matter how long it gets. They are playing the game on the Megaville Salt Flats, which are smooth and free of obstructions for hundreds of miles. The players are holding the rope four feet above the ground. The December Bonus:Assuming that the Earth's radius is 3960 miles, how far apart should the players be for the rope to just touch the ground? NOVEMBER 2017 PUZZLE - "Too Early for Sunset?" New Orleans, Louisiana has a latitude of 30 degrees North, and a longitude of 90 degrees West. Imagine that you are in NOLA on the day of the summer solstice (June 21st). At noon, you observe the Sun as being directly south. Two hours later, at 2:00 PM, the Sun has moved 15 degrees per hour towards the West, and thus has an azimuth (here, south-towards-west) of 30 degrees. In the official �Flat Earth� model, the Sun is 40 miles in diameter, and moves above the flat earth at a height of 3,000 miles. On the summer solstice, observers on the Tropic of Cancer (23.50oN) will see the sun directly overhead at noon. Therefore, on the solstice, the Flat Earth Sun will move in a circle 3000 miles above the Tropic of Cancer, and will be directly south of New Orleans, and a bit north of the Yucatan (latitude 23.5oN, longitude 90oW) at noon. What is the latitude/longitude of the Sun at 2:00 PM on the Summer Solstice? What is the Azimuth of the Sun at 2:00 PM, as observed from New Orleans, LA? OCTOBER 2017 PUZZLE - "How Far the Horizon?" Derive the approximation for the distance d to the horizon for an object at height h above the earth, d ~ √2hR, where R = radius of Earth (~ 3960 miles), and also for the angle of dip of the horizon, d/R*180/π in degrees. The October Bonus:Assuming Mt. Wahdoo-ainoh is five miles above the surrounding terrain, what is the distance to the horizon from its summit? And the Dip Angle of the horizon? SEPTEMBER 2017 PUZZLE - "How High the Sun?" The diagram below indicates a method whereby one could use measurements of the sun's elevation on the vernal or autumnal equinox to calculate the height of the sun above the earth in Voliva's flat earth model. In this diagram, an observer at 45o latitude would see the sun at that same angle above the horizon, and will be 1/8th of the 24,000-mile diameter of the flat earth away from the equator, i.e. 3,000 miles. The "height" of the sun would be calculated as 3,000 miles for this latitude. The September Bonus:What would the following people, using the method above, calculate for the height of the sun above the flat earth, as seen on the autumnal equinox? AUGUST 2017 PUZZLE - "Uphill Both Ways"
A commuter using a bicycle has a two-mile ride to work. Going to the office, the path is level for a half mile, then runs uphill at a 10% grade for one mile, then downhill at a 10% grade for a quarter mile, and finally uphill for a quarter mile at a 20% grade. The commuter goes ten mph on a level surface, half that for a 10% uphill grade, three-halves that for a 10% downhill grade, and one-quarter that for a 20% uphill grade. For a 20% downhill grade, the rider purposely limits his speed to no more than that for the 10% downhill grade. How much higher is the rider�s office above their home, in miles? How long does it take the rider to get to work from home? How long does it take the rider to get home from work? JULY 2017 PUZZLE - "Tubular Bells"
A windchime maker plans to cut a ten-foot length of conduit pipe into eight sections, such that the ratio of each piece to its longer neighbor is 4/5 = 0.8. The July Bonus:What are the lengths of the longest and shortest pieces? JUNE 2017 PUZZLE - "Gold for $100, Alex"
Created by Philip Kaplan, "Posers"
The June Bonus:Which is worth more, a carton full of $5 gold pieces or an identical carton half full of $10 gold pieces? MAY 2017 PUZZLE - "Those Quirky Quarks"
According to the Standard Model of physics, a proton is composed of 3 quarks (two ups and one down), with a positive charge of 2/3 + 2/3 - 1/3 = 3/3 = 1. While a neutron is likewise made of 3 quarks (one up and two downs), it has a neutral charge of 2/3 - 1/3 � 1/3 = 0/3 = 0. The May Bonus: The combined masses of the three quarks of a proton or neutron constitute what percentage of the rest mass of that proton or neutron? Consider the Pythagorean Scale, for which the frequency ratios to the lower C note are shown above. In the Well-Tempered Scale, on the other hand, the ratio of each note to the one preceding it is a constant 21/12. The April Bonus: For the C-scale starting at 256 Hz, what note has the largest difference between well-tempered and Pythagorean scales? How many hertz off is it? Rocky has made a sound file of the comparison, check it out here! MARCH 2017 PUZZLE - "Isn't that Special!" A few weeks after the inauguaration of President John F. Kennedy, a math teacher at a small southwestern college told his students that they were living in a very special year. The professor said "The last time this happened, Billy the Kid was being tracked by Pat Garrett. The time before that, Suleiman II ended his reign as sultan of the Ottoman Empire." The March Bonus: When was (or is) the next time this type of �Special Year� occurred (or will occur)? FEBRUARY 2017 PUZZLE - "What's Your Sign?" Jim wants to make a political sign. At the art store, letters are priced according to a simple logical rule. Jim finds that he can purchase the letters to spell TRUMP for $11, PENCE for $12, and BANNON for $14. The February Bonus: How much will Jim need to buy the letters for IMPEACH? JANUARY 2017 PUZZLE - "Keys to the Answer"
Consider the calculator above. 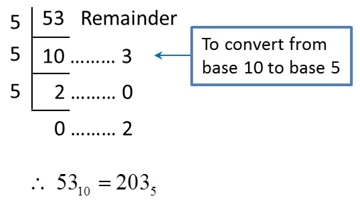 Assume that some non-zero number such as 1.0 has been placed into memory (MRC = memory recall). 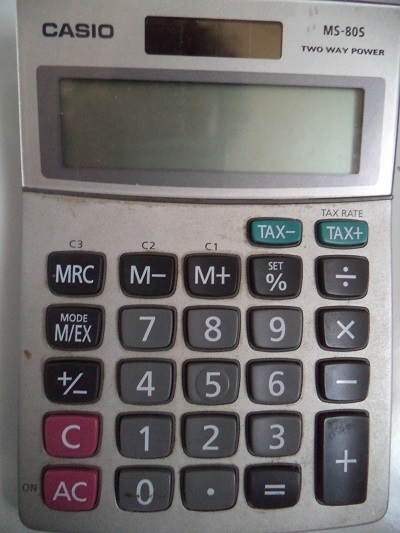 Now, consider the following sequence of calculator key strokes. The February Bonus: If the sequence above is repeated many times, what is the eventual value of MRC, and how is that related to the first key in the sequence (7)? DECEMBER 2016 PUZZLE - "Electoral College Nightmare"
The December Bonus: For the 2016 US Presidential Election, what is the maximum difference in the Popular Vote that could still result in a losing Electoral Vote? Use these data (an Excel spreadsheet with these data is available at www.nmsr.org/electoral.xls). 308758105 438 Fifty states + D.C.
NOVEMBER 2016 PUZZLE - "Math with Turkeys"
Fred's turkey farm has a total of 100 Toms and Hens, having a net weight of 1,650 pounds. 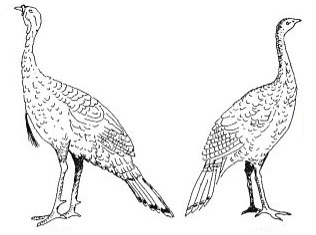 The distribution of turkey weights is remarkably uniform for each gender, and the typical Tom weighs twice as much as a typical Hen. (A) What is the largest possible Hen�s weight? How many Toms and Hens are there for this weight? (B) What is the largest Hen�s weight that is a round number of pounds? How many Toms and Hens? (C) With an equal number of Toms and Hens, what is a typical Hen�s weight? How many Toms (= # Hens)? (E) What is the smallest possible Hen�s weight? How many Toms and Hens? OCTOBER 2016 PUZZLE - "Election Night Jitters"
It�s election night, and candidate Shirley is running a tight race against candidate Ronald. Shirley has 55% of the vote, with 60% of the voters counted. The October Bonus: What is the minimum percentage of votes Shirley needs from the remaining electorate in order for her to defeat Ronald? SEPTEMBER 2016 PUZZLE - "A Pair of Swingers"
A rigid 12-inch ruler with a tiny hole at one end is hung on a nail, and allowed to swing back and forth. It is hung alongside four simple pendulums, of lengths 6, 8, 9 and 12 inches. The September Bonus: Which one of the four simple pendula has the same period as the ruler?? AUGUST 2016 PUZZLE - "Chilling by the Box"
The August Bonus: In a typical box of eight packets (=80 freeze pops), what is the most likely number of packets (0-8) having at least one pair? JULY 2016 PUZZLE - "Chilling for Summer"
Freeze pops are a popular way to cool off. There are six different colors, and ten pops in a "rack". 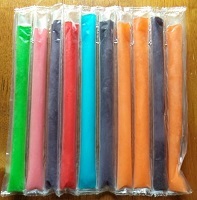 The July Bonus: In a rack of ten freeze-pops, what is the probability of having at least one adjacent pair with the same color? JUNE 2016 PUZZLE - "The Corner Garden"
Patsy wants to make a garden in the corner of her back yard, and has a fixed length L of border material to use. The corner walls bound two sides, as shown. The June Bonus: Which design has more area for gardening, the triangle or the square? MAY 2016 PUZZLE - "The Envelope, Please?" You have a cannon, which can be controlled by its tilt angle and by the muzzle velocity v0. 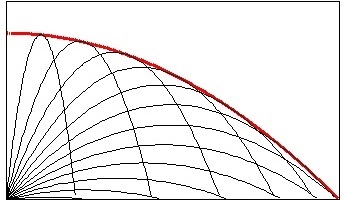 Assume that the muzzle velocity v0 is kept constant, and that the tilt angle can be varied, from shooting straight up, to shooting horizontally, as shown in the figure above. The May Bonus:The thicker line in the figure above shows the envelope of all the positions the cannon can reach at constant muzzle velocity. What is the equation of this envelope? APRIL 2016 PUZZLE - "Really Rolling Now!" Given the moment of inertia for a toilet paper roll from last month, suppose that two identical rolls are dropped at the same time. The first roll is dropped from a height h1, and allowed to free-fall to the floor. The second roll is held onto by someone's hand at a height h2, and unrolls as it falls. The April Bonus:Assuming that the drop height is small enough that the roll's moment of inertia remains constant during the fall, what is the ratio of h2 to h1 to make the rolls land at the same instant? MARCH 2016 PUZZLE - "Rolling into π Day"
The March Bonus:(A) What is the sheet thickness, ΔT? (B) What is the moment of inertia of the roll, both initially, and as a function of radius r? FEBRUARY 2016 PUZZLE - "Gardening Time"
You are busy in the garden, whipping up a batch of fertilizer for the plants. 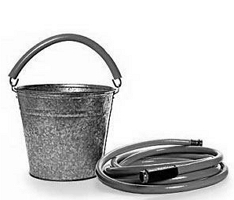 You need to measure exactly five gallons of water for the mix, but all you have at hand are two buckets (one has a three-gallon capacity, while the other holds seven-gallons). Neither bucket is graduated with gallon marks. You can get as much water as you you need from the hose, and any excess water can be used in the garden. Being clever, you quickly realize a method for using the two buckets to get exactly five gallons of water. The February Bonus:How many gallons of water need to be supplied from the hose? And how many excess gallons of water will you pour into the garden? JANUARY 2016 PUZZLE - "Where's Papa?" On New Year's Eve of 2015, a certain woman was exactly 18 years older than her child. On New Year's Eve of 2018, she will be exactly nine times older than the child. 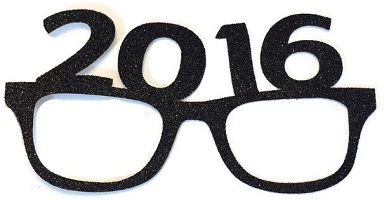 The January Bonus:On New Year's Eve 2015, where was the child's father? DECEMBER 2015 PUZZLE - "The Crooked Waiter"
The Three Stooges went to a cafe, and ordered a pizza for $15. They each contributed $5. The waiter took the money to the chef, who was a friend of the Stooges, and asked the waiter to return $5 to them. The waiter was lazy and dishonest, however, and instead of splitting the $5 fairly between the three, he just gave them $1 each, and pocketed the remaining $2 for himself. Now, Moe, Larry and Curly each had effectively paid $4, so the sum actually shelled out was $12. Along with the $2 in the waiter's pocket, everything totalled $14. The December Bonus:Where did the other $1 go from the original $15? NOVEMBER 2015 PUZZLE - "To Tell The Truth..."
Two types of intelligent bipedal organisms live on planet Blarnia: obligate liars and obligate truth tellers. The ambassador from Earth met with three Blarnians to negotiate a peace pact. One Blarnian spoke, but the ambassador didn't catch it. The second one remarked, "He said he was a liar." The third Blarnian yelled at the second, "You are lying!" The November Bonus:Is the third Blarnian a liar or a truth teller? OCTOBER 2015 PUZZLE - "Drowning in Cicadas!" You're a naturalist trying to make sense out of cicada breeding patterns. The cicadas appear in different broods, and it appears that it's best for each brood if fewer other broods come out in their preferred breeding years. That minimizes the chances of genetic mixing between broods, and helps maintain brood lines. If red cicadas brood every 7 years, and green cicadas every 14 years, how many years will it be between years where both broods make their appearance? If red cicadas brood every 7 years, and green cicadas every 13 years, how many years will it be between years where both broods make their appearance? What does this suggest re optimal brood timings? 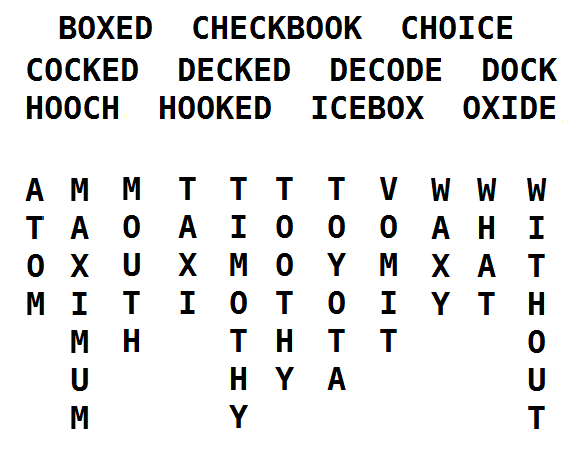 SEPTEMBER 2015 PUZZLE - "Gee Whiz!" You're in a spaceship traveling at half of lightspeed relative to the Milky Way, and you need to reduce your speed to zero in order to disembark and visit Aunt Edna. After deciding against torturing yourself for such a long time, you decide to take it a little easier, seven times easier to be precise. With a deceleration of 1.428 gees for some time, how long will it take to stop? Assuming that you can withstand the strain of 10 gees for 10 seconds, and that you'll need a full hour to recuperate from each grueling 10-second ordeal, what is your reduction in speed for one such event? And how many such efforts will it take to decelerate to zero meters/second? AUGUST 2015 PUZZLE - "Traffic was Light"
A driver on the interstate notices that, between every pair of adjacent mile markers, he encounters 30 cars in the oncoming lanes, on average. Assuming that cars in both directions are going the legal limit, what is the actual density of cars per mile for the oncoming lanes? A radio report informs the driver that that cars in the oncoming direction are going half of the legal limit, while cars going in his direction are doing the limit. What is the actual density of cars per mile for the oncoming lanes? A radio report informs the driver that that cars in the oncoming direction are going the legal limit, while cars going in his direction are doing half of the limit. What is the actual density of cars per mile for the oncoming lanes? July 2015 PUZZLE - "Comin' Round the Track!" A train departs from New York City (NYC), heading toward Los Angeles (LA) at 100 mph. 3.5 hours later, a train departs from LA heading toward NYC at 200 mph. Assume there are 2000 miles of track between LA and NYC. The July Bonus:(A) When do they meet? (B) When they meet, which train is closer to NYC? June 2015 PUZZLE - "Winding Atomic Clocks"
Assume a particular radioactive isotope (say, Uranium 238) has a "slow" half-life of TS (say, 4.48 billion years). Suppose that a sample has been collected from a given rock, and that the ratio of daughter isotope of lead (Pb206) to parent isotope (U238) in the sample is RS = 0.295. Likewise, a sample of a different radio-isotope (say, Uranium 235) with a "fast" half-life of TF (say, 704 million years) has also been collected from the same rock, and its ratio of daughter isotope (Pb207) to parent isotope (U235) is RF = 9.09. Concordia/Discordia Chart: the horizontal axis is the fast daughter/parent ratio RF, and the vertical axis is the slow daughter/parent ratio RS. (B) What will the ratios (RF, RS) = (9.09, 0.295) become after an additional time interval ΔT of 1 billion years? (C) What will the ratios (RF, RS) = (18.18, 0.590) become after an additional time interval ΔT of 1 billion years? May 2015 PUZZLE - "To Infinity, and Beyond!" For this puzzle, assume X is any non-zero number, and consider the iterative process in which X is replaced by 2 + 15/X. The May Bonus:What does X converge to? April 2015 PUZZLE - "Sustaining Livestock with the Joneses"
Farmer Jones owns four times as many sheep as cattle. The grass on his farm is currently 12 inches high, and grows at a rate of two inches per day. The grass on one acre of Farmer Jones' farm can support a dozen cattle for six days, accounting for daily growth. Alternatively, one acre of Farmer Jones' farm grass can support three dozen sheep for twelve days, again accounting for growth. March 2015 PUZZLE - "Calling Dr. Venkman"
A psychology class is testing their ESP abilities with Zener cards (five cards: circle, square, bacon, star, and cross). The March Bonus:If each pair of students performs 25 trials, what is the minimum number of matches for the probability of guessing the cards to be less than one in a million? February 2015 PUZZLE - "Even Money Powerball Bet?" The February Bonus:What is the jackpot amount for an even bet (expected winnings = zero), for the situation in which (A) only the jackpot is considered, and the situation in which (B) all nine prizes are considered? January 2015 PUZZLE - "Moving Sidewalk"
When his parent's holiday flight was cancelled because of snow, bored little Bobby decided to do some physics experiments on the Moving Sidewalk. He found that it took three minutes to go the length of the Sidewalk if he walked at his normal speed in the same direction as the Sidewalk was moving. He also found it took him six minutes to go the same length walking normally in the "wrong" direction. The January Bonus:When the snow caused a blackout, the Moving Sidewalk stopped working. How many minutes did it take Bobby to walk the full length of the disabled Sidewalk? December 2014 PUZZLE - "I Just Need a Pair of Socks!" A frugal bachelor has exactly seven pairs of socks; four pairs are black, and three are white. The December Bonus:If all 14 socks are lying around in random positions inside the bachelor's dryer, and he grabs the first two socks he can find in the dark, what is the probability he'll have (A) A black pair? (B) A white pair? (C) No pair at all? November 2014 PUZZLE - "The Frugal Stalker"
A certain stalker was tailing the target of his desires at the mall. As his prey entered several stores in the mall, the stalker would also enter the same store, but would always buy something to allay suspicion. At the first store his victim entered, the stalker spent a third of the money he had on his person. At the second store, he spent a third of the remaining amount. And at the third store, he again spent a third of the remaining amount. The November Bonus:If the stalker spent $38 all together, how much did he start with? October 2014 PUZZLE - "Who got my jersey?" James Randi, Michael Shermer, Richard Dawkins, and Neil deGrasse Tyson were all entered in a charity volleyball game. The sponsors printed up special jerseys with each of the four men's names. When Randi mischievously suggested that everyone wear another's jersey, all agreed with his marvelous prank. Randi wasn't wearing the jersey that belonged to Shermer. Dawkins didn't wear Randi's jersey, nor vice versa. Neil deGrasse Tyson got to serve ahead of the person wearing Randi's jersey. September 2014 PUZZLE - "Faster than g?" A hinged rod of length L is held at rest at an angle θ, and then released. At precisely the same moment, a steel ball is released from the same height as the top of the rod. The September Bonus:If vrod is the speed of the tip of the rod as it hits the flat table top, and vff is the speed of the free-falling steel ball as it impacts the same table top, what is the ratio of vrod to vff ? August 2014 PUZZLE - "The Physicist's Spouse"
A physicist's spouse used a wheelchair, and this was firmly hooked to latches on the van's floor during excursions. The physicist wanted to minimize accelerations and decelerations while driving, as these were uncomfortable for his passenger. As they were cruising along at 12 meters/second (~27 mph), a red light turned on at the stop bar of the next intersection, a mere six meters away. The August Bonus:Assuming the physicist applied constant brake pressure during the stop, and reduced the van's speed to zero just as it reached the stop bar, what was the time τ for the braking maneuver? And what was the constant acceleration ao required? BONUS Bonus #2: Suppose the physicist used a linear deceleration rate, such that he covered the six meters in a time τ , starting at zero acceleration, and ending with zero speed, and acceleration ao at the stop bar. What is the time τ for this braking maneuver, and what is the final acceleration ao? BONUS Bonus #3: Suppose the physicist used a linear deceleration rate, such that he covered the six meters in a time τ , starting at acceleration ao, and ending with zero speed and zero acceleration at the stop bar. What is the time τ for this braking maneuver, and what is the initial acceleration ao? BONUS Bonus #4: In all three bonuses, the area under the acceleration curve from 0 to τ is the same for the two givens (6 meters to stop from an initial speed of 12 m/s). What is this area, and what does it signify? And, which of the three alternatives given is the best for the delicate spouse? July 2014 PUZZLE - "Gettin' Both Trucks Home"
University of Texas at Austin biologist David Hillis has a favorite "stuck in the middle of nowhere" story with a happy ending. He was out in his truck, hours away from Austin, when his alternator light came on. He watched his voltmeter drop until the truck stopped, hundreds of miles away from the closest place that could repair the alternator. Luckily for Hillis, his good friend Jim happened to drive by, and stopped to help. David Hillis could have ridden back to Austin with Jim, of course, but then his truck with its broken alternator and drained battery would still have been stuck in the middle of nowhere. Using one truck to tow the other was not feasible, either. However, the two clever men hit on a plan, and proceeded to return both trucks to Austin in a matter of just a few hours. The July Bonus:How did David and Jim get both trucks back to Austin? June 2014 PUZZLE - "A Question of Time"
The June Bonus:The hour and minute hands are at equal distance from the 6 hour, what time will it be exactly? May 2014 PUZZLE - "How Much Can Jesús Save?" A large grocery-store chain, Krikey's, has a promotion where their “Krikey Club” customers can get discounts on automobile fuel. For every dollar a customer spends at Krikey's, they get a point. When enough points are accumulated, they can be cashed in for gas discounts at the pump. The discounts come only in 10-cent intervals: 100 points gets the shopper a 10-cent discount per gallon of gas, 200 points would fetch a 20-cent discount, and so on up to 1000 points, and the maximum discount of a dollar per gallon. Discounts can not be used for more than 35 gallons at a time. Points that are not used by the end of each calendar month are forfeited, and each month starts a clean slate for each customer. Shopper Jesús Martinez spends the equivalent of 20 dollars per day at Krikeys every month. His old car's gas tank has a 24-gallon capacity, and he uses one gallon of gas per day. Assume the price of gas for a typical month is $3.33 per gallon, and that a month is 30 days long (for ease of calculations). The May Bonus:What is the most Jesús can save? And how does he do it? April 2014 PUZZLE - "Black and White Hats"
The captives are lined up in order of height, and are tied to stakes. The man in the rear can see the backs of his two friends, the man in the middle can see the back of the man in front, and the man in front cannot see anyone. 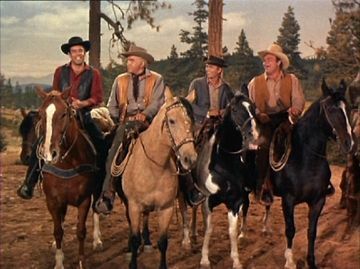 The cannibals show the men five hats. Three of the hats are black and two of the hats are white. The April Bonus:How did he know the color of his hat and what color was it? March 2014 PUZZLE - "An Engineer, A Physicist, And A Mathematician..."
The physicist made a fence all the way around the world, and said that fencing off one half of the Earth was the best possible outcome. The mathematician laughed at the others and, with his design, beat them all. The March Bonus:What was the mathematician's design? February 2014 PUZZLE - "The Seating Planner"
Three couples are to be seated at a circular table surrounded by chairs numbered # 1-6. The Host has each person draw a random number, 1 through 6, and sit in that seat. The February Bonus:What is the chance that no one will sit next to their "significant other" ? January 2014 PUZZLE - "What Am I?" Always old, sometimes new, never sad, sometimes blue. Never empty, sometimes full, never pushes, always pulls. The January Bonus:What Am I? December 2013 PUZZLE - "Plumb Strange"
Consider an irregular flat surface such as pictured below. To find the center of mass of the object, three plumb lines have been drawn, but the measurements weren't exact, and the three lines do not intersect at a single point. Instead, the three intersections lines form a triangle as shown. The December Bonus:Assuming that the probability of finding the true center of mass on either side of each line is ½, what is the probability that the true center of mass is actually located within the triangle? November 2013 PUZZLE - "Highway 119,163 Revisited"
The November Bonus:	A commuter who dabbles in mathematics has observed that, when he travels north on his preferred interstate highway, the difference between the highway's mile markers and his own car's odometer is a constant. (Actually, this 'constant' can change drastically for different interstate trips, and even varies a bit during a single trip, but let's assume it's a constant for any given trip.) He has also observed that, when he's on the same freeway southbound, the sum of the highway's mile markers and his own car's odometer is a (different) constant. As our commuter leaves a small town and enters the interstate, he notes that his constant for this trip is 119,163, while if he had gone the other direction, his constant would have been 118,799. What is the interstate mile marker at this intersection? What is the commuter's odometer reading here? Which direction is he going on the freeway? October 2013 PUZZLE - "A Nine Digit Bonus"
Chapter 16 of Martin Gardner’s Wheels, Life and Other Mathematical Amusements shows how the nine non-zero digits may be arranged in two groups so that 158x23 = 79x46, which gives the product of 3634. He tells us there are two more solutions that arrange the same nine digits in the same pattern(three digits times two digits equals two digits times two digits), with the two products both being larger than 3634. The October Bonus:What are they? And can you find them without using a computer? September 2013 PUZZLE - "What is her name?" The September Bonus: Solve for x. The September BONUS Bonus: If the first seven digits of x after the decimal were someone's phone number, what is her name? August 2013 PUZZLE - "The Sock Drawer"
A drawer contains red socks and black socks. 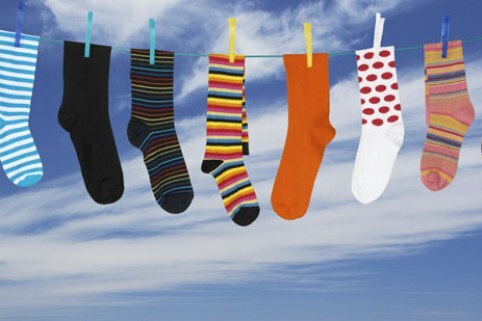 When two socks are drawn at random, the probability that both are red is 1/2. The August Bonus: How small can the number of socks in the drawer be? The August BONUS Bonus: How small can the number of socks in the drawer be, if the number of black socks is even? ? July 2013 PUZZLE - "Rock,Paper,Scissors,Lizard,Spock"
Physicist Leonard thinks that traditional "Rock, Paper, Scissors" produces too many ties, and has proposed expanding the popular hand game to "Rock, Paper, Scissors, Lizard, Spock." The expanded rules are: Scissors cuts Paper, Paper covers Rock, Rock crushes Lizard, Lizard poisons Spock, Spock smashes Scissors, Scissors decapitates Lizard, Lizard eats Paper, Paper disproves Spock, Spock vaporizes Rock, and (as it has always) Rock crushes Scissors. The July Bonus: If the game is played 900 times, with a good random number generator to pick the choices for both players, how many fewer ties will there be with "Rock, Paper, Scissors, Lizard, Spock" than with the old "Rock, Paper, Scissors? June 2013 PUZZLE - "Felix's Selection..."
Felix Unger, known for his fastidiousness and attention to detail, needs three pens for a task. Roomie Oscar Madison's pen jar has a jumble of 30 pens – eleven red, nine brown, six black, and four violet. The June Bonus:If pens are chosen without looking, what is the minimum number of pens that Felix must withdraw from the jar to ensure having three of the same color? May 2013 PUZZLE - "And the Winner Is..."
The May Bonus:What is the next number in the following sequence? April 2013 PUZZLE - "ROLL DEM BONES"
When you roll a pair of six-sided dice, the most likely result is 7, with a probability of 6/36 = 1/6. The April Bonus:What is the likeliest value and corresponding probability for rolling four dice? And for rolling six dice? March 2013 PUZZLE - "CIRCULAR REASONING"
A circular table is pushed against two walls at right angles to each other. The March Bonus: If a spot on the rim is eight inches from one wall and nine inches from the other, what is the diameter of the table? February 2013 PUZZLE - "A SIMPLE MULTIPLICATION"
This problem is intended as a warm-up for the upcoming March meeting, showing how hard it is to factor the product of a simple multiplication. The February Bonus: What two prime numbers multiplied together equal 70,531? January 2013 PUZZLE - "Nyuk Nyuk - A Half a Loaf is Better than What?" 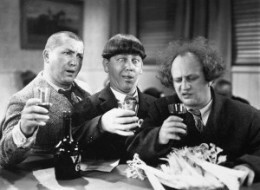 The Three Stooges walked into a Deli to buy some bread. Moe bought half the bread remaining on the shelves, and half of a loaf more. Larry and Curly each did the same. After they had left, the baker promptly closed the Deli, as his bread was sold out. Surprisingly, the baker didn't need to cut even one loaf. The January Bonus: how many loaves were on the shelves when the Stooges came in? December 2012 PUZZLE - "Couch Potato"
Both stations are showing real programming. The December Bonus: in the long run, which scenario (1,2, or 3) is most likely? And which is least likely? November 2012 PUZZLE - "Langford's Problem"
In Martin Gardner's Magic Show, he describes Langford's Problem, which is to arrange four pairs of cards: two aces, two deuces, two threes, and two fours side by side in a row so that one card separates the aces, two cards separate the deuces and so on. What is the solution? Apparently there are no solutions with five or six pairs of cards, but there are 26 solutions with seven pairs. October 2012 PUZZLE - "Repeating Decimal"
Find the reduced fraction that is equal to 0.967032967032967032... .
September 2012 PUZZLE - "The Speed of Shadow"
As his shadow lengthens, does the top of the shadow move faster or slower or at the same rate as it did when it was shorter? August 2012 PUZZLE - "Triangular Solitaire"
7-2, Jumping from the #7 position over the pin on spot #4 into the vacant #2 spot, removing the pin at spot #4. 9-7, removing the pin at spot #8. 1-4, removing the pin at spot #2. 7-2, removing the pin at spot #4. 6-4, 4-1, 1-6, a triple jump removing pins at spots #5, #2, and #3. 10-3, removing the pin at spot #6. Starting with a vacancy at spot #3, show how to remove eight pins in five jumps, leaving only one pin standing. JULY 2012 PUZZLE - "That Old, Lazy River"
A boat can travel at a speed of 3m/sec on still water. A boatman wants to cross a river whilst covering the shortest possible distance. In what direction should he row with respect to the bank if the speed of the water is (A) 2 m/sec, (B) 4 m/sec.? Assume that the speed of the water is the same everywhere. JUNE 2012 PUZZLE - "Paging Dr. Bayes..."
In a large hospital, Dr. Bayes was wondering about the accuracy of a certain test for the dreaded Cambrian Protoplasmic Ailment (CPA), which affects 1% of the general population. The test itself is touted as being 88% accurate (this is the probability that people suffering the disease get a positive test result). Bayes finds additional information showing that the false positive rate for the test is 8%. (A) If patient John Doe gets a positive test result, what is the probability he has CPA? (B) If patient John Doe gets a negative test result, what is the probability he has CPA? MAY 2012 PUZZLE - "An N-Step Program"
There is a long escalator of N steps in height. Young Albert likes to time how long it takes to get to the top of the escalator when he runs different numbers of steps before riding the rest of the way. Albert finds that, if he runs 14 steps, then it takes an additional 42 seconds to reach the top. And, if he runs 24 steps, it only takes 27 seconds more to reach the top. (A) How many steps does the escalator have? 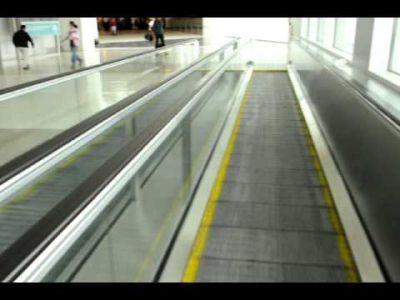 (B) How fast is the escalator moving? (C) How long would it take to ride the whole way (no running)? (D) What is Albert's maximum running speed with respect to the escalator? APRIL 2012 PUZZLE - "The Triangular Pins"
In bowling, how many of the ten pins can be placed simultaneously on their spots without forming an equilateral triangle? 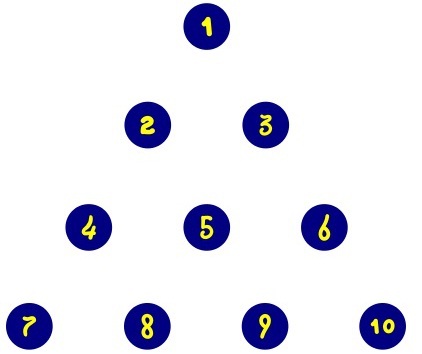 Thus pins 1, 7, and 10 would form an equilateral triangle, as would pins 6,9, and 10. MARCH 2012 PUZZLE - "The 15-minute Egg"
Here's a problem from Martin Gardner's "Mathematical Circus" which he credited to Carl Fulves, who wrote many books on magic: "With a 7-minute hourglass and an 11-minute hourglass, what is the quickest way to time the boiling of an egg for 15 minutes?" 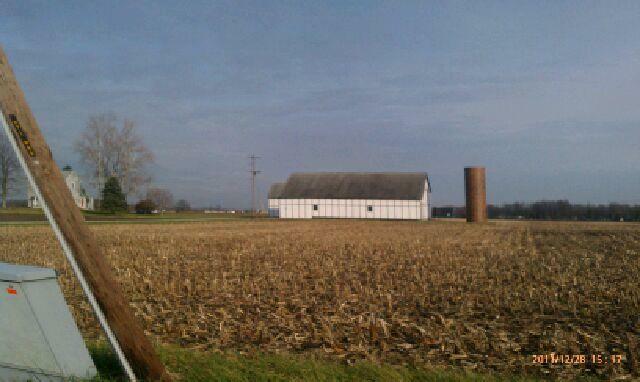 FEBRUARY 2012 PUZZLE - "Something is Askew..."
Consider these pictures, taken from a moving car with an i-phone's camera. 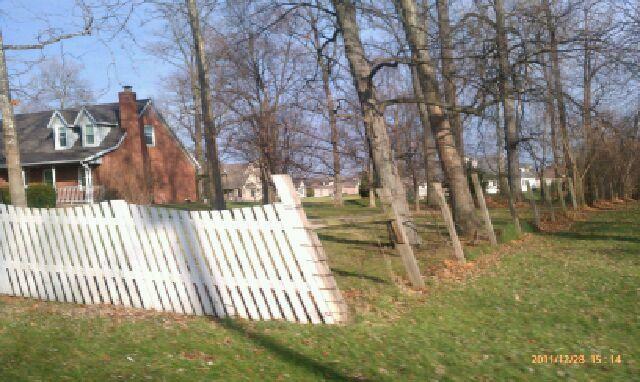 In these images, the telephone pole, picket fence, houses, etc. are all actually vertical, and the tilt is only an artifact of the car's motion. Note that the skewing effect depends on distance. All the images were taken from a car moving at ~ 55 mph (to the left). The effect is strongest for the closest objects. 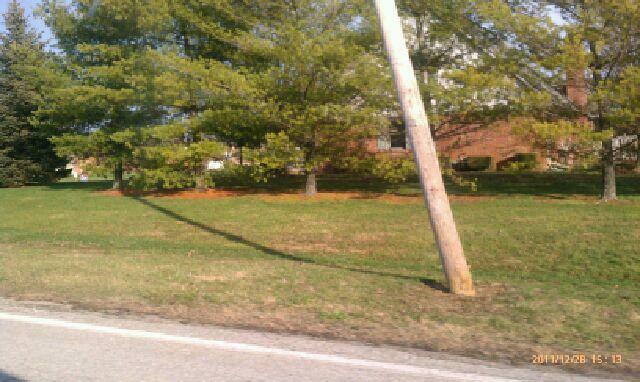 If the camera is pointed at a right angle to the line of travel, and if the telephone pole in the first image is about 12 feet away from the camera's line of travel, and if the car is moving at about 55 mph, then the pole will appear to be tilted by about 15 degrees. Given all that, how long does it take for this camera to save an image? JANUARY 2012 PUZZLE - "Bungee Fever"
Courtesy "200 Puzzling Physics Problems" by Gnädig, Honyek and Riley, 2001. A man of height h0 = 2m is bungee jumping from a platform situated at a height h = 25m above a lake. One end of an elastic Bungee cord is attached to his foot, and the other end is fixed to the platform. The man drops from rest in a vertical (head-down for convenience) position. The length and elastic properties of the bungee cord (treat it like a classical spring with constant K) are such that the man's speed is zero at the instant his head just reaches the surface of the lake. Eventually, the jumper ends up dangling with his head 8 meters above the water. (A) What is the unstretched length of the Bungee cord? (B) What was the jumper's maximum speed? (C) What was the maximum tension in the Bungee cord? 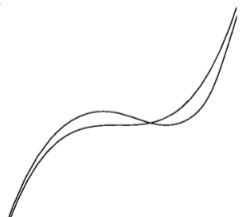 (D) What was the jumper's peak acceleration? DECEMBER '11 PUZZLE - "Honey, I Shrank the Solar System FOLLOWUP"
If the solar system were proportionally reduced so that the average distance between the Sun and the Earth were 1 meter, and the density of matter was unchanged, how far away would a 60-kg observer have to be for his or her gravitational effect on the tiny Earth to be just equal to the tiny sun's effect? Assume no other matter is nearby. NOVEMBER '11 PUZZLE - "Honey, I Shrank the Solar System..."
IF the solar system were proportionally reduced so that the average distance between the Sun and the Earth were 1 meter, how long would a year be? Take the density of matter to be unchanged. The November Bonus: How long would a year be? OCTOBER '11 PUZZLE - "A Certain Height"
If you take a lead ball up a ladder and let it go, it falls to the ground. If you take it up a tall building and let go, it still falls to the ground. If you take it up in a plane and drop it, it falls to the ground, in due course. If you take it up to a certain height and let it go, it remains suspended at that point. The October Bonus: What height is it? SEPTEMBER '11 PUZZLE - "Remainder of One"
Adapted from Intriguing Mathematical Problems by Oswald Jacoby, with W. H. Benson. The September Bonus: What is the smallest number divisible by 13 which, divided by any of the numbers 2 to 12 inclusive, leaves a remainder of 1? AUGUST '11 PUZZLE - "The Pop Quiz"
The August Bonus: Is this equation valid? Why? JULY '11 PUZZLE - "The Painted Cubes"
From my father's collection: A number of identical white cubes are to have painted on each face a line through the center of the face and parallel to one pair of edges. Thus the line on any face might be oriented in either of two directions. How many cubes can be painted in this way so as to be distinguishable from one another? Two patterns are distinguishable if and only if one is not a rotation of the other. The July Bonus: How many cubes? JUNE '11 PUZZLE - "Across the River Wide"
Submitted by Christopher Allan, UK. Two boats start off to cross a river from opposite sides at the same time. They meet at a point 720 yards from the nearest shore, reach the opposite bank, then set off in return, meeting again 400 yards from the other shore. Constant speeds again. The June Bonus: How wide is the river? MAY '11 PUZZLE - "The Advancing Column"
A column on the march is 4 miles long. A man at the rear decides to run ahead to the front, speak briefly to someone at the front, and run back to the rear. During this time the column has advanced 3 miles. Assume speeds constant and instantaneous turning. The April Bonus: How far did the runner travel? APRIL '11 PUZZLE - "The Erudite Bookworm"
The April Bonus: How long will it take the Erudite Bookworm to digest his way through Shakespeare? MARCH '11 PUZZLE - "Look, Ma – No Hands!" 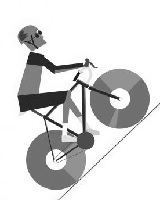 The January Bonus problem about determining the direction of bicycle travel was fascinating. Maybe our readers will find similar satisfaction in the following bicycle problems. 1. Is the ability to ride "no hands" the result of fork geometry or gyroscopic forces? 2. If you're riding "no hands" and you push forward gently on the right handlebar, which way will the bike turn? 3. If you have a friend keep a stationary riderless bicycle upright and you then reach down and push the lower pedal to the rear, which way will the bicycle move? Which way will the pedals move? 4. Since the left pedal rotates clockwise relative to the crank, why is a lefthand thread used on the pedal spindle? 1. Is the ability to ride "no hands" the result of fork geometry or gyroscopic forces? Ans. Fork geometry. This question was answered most persuasively by David E.H. Jones in the April 1970 issue of Physics Today, reprinted in Sept. 2006, showing the gyroscopic forces had very little effect but the fork design could result in ultra stability. 2. If you're riding "no hands" and you push forward gently on the right handlebar, which way will the bike turn? Ans. To the right. Due to counter-steering my bike swerves very slightly to the left and then steers into a right-hand turn with no force from my left hand. 3. If you have a friend keep a stationary riderless bicycle upright and you then reach down and push the lower pedal to the rear, which way will the bicycle move? Which way will the pedals move? Ans. The bicycle will roll backward and the pedals will rotate backwards in apparent defiance of the direction you're pushing. It's worth doing the experiment with a real bicycle. 4. Since the left pedal rotates clockwise relative to the crank, why is a left-hand thread used on the pedal spindle? Ans. Due to the downward force on the pedal, the pedal spindle in contact with the internal threads of the crank is given a counter-clockwise torque which would loosen a right-hand. thread. FEBRUARY '11 PUZZLE - "Kid Conundrum!" Courtesy Brain Teasers Forum, BrainDen.com. - Peter, how old are your children? - Well Thomas, there are three of them and the product of their ages is 36. - The sum of their ages is exactly the number of beers we have drunk today. - That is still not enough. - OK, the last thing is that my oldest child wears a red hat. The February Bonus: How old were each of Peter's children? JANUARY '11 PUZZLE - "Follow That Bike!" The January Bonus: (A) Does Holmes know what he's talking about? (B) Try to determine the direction of travel for the idealized bike tracks in this diagram. 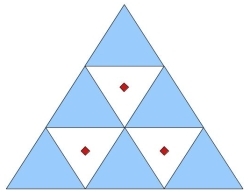 DECEMBER '10 PUZZLE - "The Three-Pointed Problem"
Consider these nine equilateral triangles; centroids are shown for the three non-shaded triangles. The December Bonus: What is the ratio of areas of the triangle whose vertices are the three centroids shown, to any individual triangle? And, to the large triangle composed of nine small ones? NOVEMBER '10 PUZZLE - "A PLAYGROUND RACE"
A playground race will be won by the runner who most quickly runs from a starting pole to a long North-South wall, touching any point along the wall, and then runs to a finishing pole which is 90 feet due northeast of the starting pole. If the wall is 70 feet west of the starting pole, what is the shortest distance the winner can run? OCTOBER '10 PUZZLE - "Binary Bemusement"
Just over 50 light years from Earth, the two small stars comprising Castor C orbit each other with a period of 0.8 days, orbital speeds of 0.0004c (c=lightspeed), and a separation of about 1.39x10-7 lightyears (~1.6 million miles). Assume that the orbital plane of Castor C contains/is parallel to the line-of-sight from Earth. If Einstein had been wrong – if the light emitted by these binary stars did indeed depend on the motion of the source, and moves toward Earth at speeds between 0.9996 and 1.0004c -- then, what would an Earth-based observer see upon training a telescope on Castor C? (A) The two stars, both bright points moving in oscillating paths along opposite directions, with a period of just over 19 hours. (B) Both stars, producing a continuous path of light, perhaps a very elongated ellipse. (C) Two "necklaces" with dozens of stars in each, moving in the same direction, with stars appearing as pairs on one side of the necklace, and disappearing as pairs on the other side. BONUS BONUS: How large a telescope (Newton reflector diameter) would be required to actually resolve the separate images of the binary stars? SEPTEMBER '10 PUZZLE - "Series-ously Infinite!" Consider the replacement X ? 1 + 1/X. (A) If the first X is 1, what does the series (1, 2, 3/2, 5/3, …) converge to? (B) What do you get if you square the answer for (A), then subtract one? (C) What mathematician am I thinking of? AUGUST '10 PUZZLE - "Super-Size Me!" Use the nine digits, 1,2,3,4,5,6,7,8,and 9, each exactly once to form two numbers which give a maximum when multiplied together. Thus, 7128 times 56934 uses the digits properly but doesn't give the maximum possible product. The August Bonus: What two numbers yield the maximum product? JULY '10 PUZZLE - "All Downhill From Here"
A physicist notes that two solid spheres of different sizes roll down a ramp at the same speeds, and similarly for two thin-walled hollow spheres, two solid cylinders, and two thin-walled hollow cylinders. When he races different shapes, however (such as a thin-walled hollow cylinder versus a solid sphere), they run at different speeds. The July Bonus: If some solid and thin-walled hollow cylinders and spheres (four objects all together) are released simultaneously at the top of the ramp, in what order will they arrive at the bottom? JUNE '10 PUZZLE - "MISSPELLING MISSISSIPPI"
Of all the ways of arranging all eleven letters of Mississippi, how many ways don't spell Mississippi? 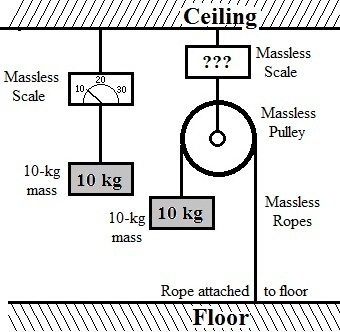 MAY '10 PUZZLE - "The Weightless Scale"
On the left, the massless scale hanging from the ceiling will read "10 kg" for the 10-kg mass shown. On the right is a system with a similar hanging scale, supporting a massless pulley and a 10-kg mass, with one rope anchored to the floor, as shown. The May Puzzle: What is the reading on the Weightless Scale above the pulley?. APRIL '10 PUZZLE - "Finding Inner Balance"
The April Puzzle: Can you arrange these seven weights from left-to-right to make this mobile perfectly balanced? Each weight is used only once. MARCH '10 PUZZLE - "Thar She Goes!" Two uniform rods of equal length and unequal masses are connected by a massless and frictionless hinge. Initially, the rods are at rest, forming an equilateral triangle with a frictionless surface. At time t = 0 the lower ends of the rods begin to slide apart with only the force of gravity acting upon the system. The March Puzzle: When the system comes to rest, how far has the hinge moved horizontally from its original position? FEBRUARY '10 PUZZLE - "Big Crowd at the Inn"
41 persons eat at an inn. The total bill is 40 sous and each man pays 4 sous, each woman 3, and each child 1/3 sou. The February Puzzle: How many men, women, and children were there? JANUARY '10 PUZZLE - "Time?" Simpkins and Green made arrangements to meet at the railroad station to catch the 8:00 train to Philadelphia. Simpkins thinks that his watch is twenty-five minutes fast, although it is in fact ten minutes slow. Green thinks his watch is twenty minutes slow, while it has actually gained five minutes. The January Puzzle: What will happen if both men, relying upon their watches, try to arrive at the station five minutes before train time? DECEMBER '09 PUZZLE - "The Absent-Minded Rider"
A bike enthusiast often rides several miles (mostly downhill) to his favorite lunch spot, Dan's Diner. He wanted to compare his average speed getting to the diner to his average speed for the more difficult return. The rider zeroed out his trusty Schwinn speedometer, and then used it to find that his average speed getting to lunch was 12 miles per hour (mph). After dining, however, the rider forgot to re-set the speedometer. Upon his return from lunch, the cyclist observed that the average cycling speed for the entire round trip was 9 mph. But, the rider still didn’t know what his return speed was. The December Puzzle: What was the rider’s average speed on his return from lunch? NOVEMBER '09 PUZZLE - "What Comes Next?" The November Puzzle: What is the next number in the sequence 1, 7, 23, 63, 159, 383…? OCTOBER '09 PUZZLE - "The Empty Flask"
An apothecary found six flasks capable of holding 16, 18, 22, 23, 24, and 34 fluid ounces respectively. He filled some with distilled water, and then filled all but one of the rest with alcohol, noting that he had used precisely twice as much alcohol as water. The October Puzzle: Which flask was left over? And which flasks were used for water, and which for alcohol? SEPTEMBER '09 PUZZLE - "The Six Knights"
A small 3x4 chessboard has three black knights ( ) and three white knights ( ) as shown. AUGUST '09 PUZZLE - "Fibonacci’s Metric Converter"
While on an expedition to Canada, an American scientist noticed a metric conversion factor hidden in the Fibonacci Series, which starts with two 1’s as the first two elements. Each subsequent element is the sum of the two preceding ones: 1, 1, 2, 3, 5, 8, 13, 21, 34, 55, 89, 144, … . During numerous mental conversions between miles and kilometers, the scientist noticed that, if a given element of the series represented a distance in miles, the following element was close to the equivalent distance in kilometers. For example, 3 miles is close to 5 kilometers; 5 miles is close to 8 kilometers, and so on. The August Puzzle: For which two consecutive elements of the Fibonacci series is their ratio closest to the actual number of kilometers in a mile? For which two consecutive elements is the estimation error, in meters, the smallest? The August UBER-Puzzle: What are the two integers less than 20 which, if taken as the first two elements of the series, yield at least one conversion in the series with an estimation error of less than two meters? What is "Estimation Error in Meters"? Consider 100 miles ~ 161 kilometers. The actual number of kilometers in 100.0 miles is 100*1.609344 = 160.934 km, which is .066km (66 meters, 65.6 m for the truly geeky) from the "goal" of 161.000 km. For 100mile ~ 161km, then, the "Estimation Error" is about 66 meters. JULY '09 PUZZLE - "Bargain Day"
On the final day of his close-out sale, a merchant hastily disposed of two lamps at the bargain price of $12 apiece. He estimated that he must have made some net profit on the combined transactions, since he made a 25 percent profit on one, and only took a 20 percent loss on the other. The July Puzzle: Was he correct in his estimate? JUNE '09 PUZZLE - "The Big Shakedown"
At a Seismology conference, several scientists attending Session A (Sustained Shaking Events) celebrated the meeting by having every attendee shake hands with everyone else in the room. In the next room, all the participants of parallel Session B (Shakytown After the Big One), similarly shook hands all around. The June Puzzle: If the number of handshakes for Session B was exactly 50 more than for Session A, how many scientists were in Sessions A and B respectively? MAY '09 PUZZLE - "Mystery on the Second Floor"
There are three light switches on the ground-floor wall of a three-story house. Two of the switches do nothing, but one of them controls a bulb on the second floor. When you begin, the bulb is off. You can only make one visit to the second floor. The May Puzzle: How do you work out which switch is the one that controls the light? APRIL '09 PUZZLE - "Monkey Madness"
On a desert island, five men and a monkey gather cocoanuts all day, and then sleep. One man awakens. He divides the cocoanuts into five equal shares. There is one left over, which he gives to the monkey. He hides his share and goes to sleep. The next man then awakens and does the same, and so on for all the men. The April Puzzle: What is the minimum number of cocoanuts originally present? MARCH '09 PUZZLE - "Back to the Ponderosa"
Three brothers, Joe, Adam, and Hoss, can together pick twice as many goobers per hour as Joe alone, and three times as many as Adam alone. The March Puzzle: if the slowest picker can pick a pound per hour, how fast can the brothers pick by themselves, and as a team? FEBRUARY '09 PUZZLE - "A MATHEMATICAL JOKE"
The following problem was published as problem E163 in the American Mathematical Monthly, 1935, and reprinted by Ross Honsberger in Mathematical Morsels, 1978, as "A Mathematical Joke" What's the answer, and what's the joke? A man purchased at a post-office some one-cent stamps, three-fourths as many two's as one's, three-fourths as many five's as two's, and five eight-cent stamps. He paid for them all with a single bill, and there was no change. The February Puzzle: How many stamps of each kind did he buy? JANUARY '09 PUZZLE - "WHAT COMES NEXT?" 3, 8, 14, 23, 37, 58? DECEMBER '08 PUZZLE - "AGAINST THE ODDS"
Three cards are to be selected at random from a packet of playing cards. The December Bonus: If the odds are 11 to 2 against all three being spades, how many cards are in the packet and how many are spades? NOVEMBER '08 PUZZLE - "ELECTORAL CLOUT"
In the near future, many of the 50 states of the union, including New Mexico and Texas, will have different numbers of congressional representatives than at present. In the presidential electoral college, the number of electors per state equals that state’s number of congressmen, plus two (for the state’s senators). The number of congressmen is directly proportional to the state’s population. If the future number of congressmen in Texas is eight times that of New Mexico, then New Mexico would realize 20% more clout with the electoral college than with strict proportional representation, while Texas would realize 10% less clout. The November Bonus: What is the future number of congressional representatives nationwide? 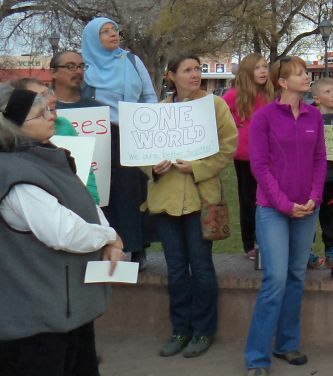 In New Mexico? In Texas? HINT: in this hypothetical Future, the number of congressmen is NOT federally mandated as 438. OCTOBER '08 PUZZLE - "MARKET MELTDOWN"
Investor Henry “Hank” Swank uses the services of “Todo Toro” discount brokers, which charges $10.00 for each buy/sell transaction. On Monday, he used the service to buy 250 shares of FBNC (Fly By Night Corp.), at $60.00 per share. By Tuesday, these stocks had increased in value by 60%, and Hank decided to sell. By the time the sale transaction went through, however, the volatile stocks had lost 3/8 of their value. The October Bonus: What was Hank’s Gain or Loss? SEPTEMBER '08 PUZZLE - "THE SOCIAL SECURITY NUMBER"
Reading a social security number consisting of the 9 digits, 1 through 9 though not in that order, from left to right, the first two digits form a number divisible by 2, the first three digits form a number divisible by three, the first four digits form a number divisible by four, and so on through all nine digits so that the entire nine-digit number is divisible by 9. The September Bonus: What is the number? AUGUST '08 PUZZLE - "The Time Is...?" As a man was strolling through downtown, he popped into the office of the Ministry of Puzzles. He asked the receptionist "Good morning. Do you have the time?" The receptionist answered "Simply add one quarter of the time from midnight until now to half the time from now until midnight, and you will have the correct answer." The August Bonus: What time was it? Double Bonus: Had the man said “Good afternoon…” instead, what time would it have been? JULY '08 PUZZLE - "THE CHICKEN OR THE EGG?" A New Mexican chicken farmer hired a consultant recently laid off from Los Alamos Lab. After much study, the consultant announced that "One and a half hens can lay one and a half eggs in one and a half days." The July Bonus: How many hens are needed for the farmer to produce a dozen eggs in six days? JUNE '08 PUZZLE - "TWO TRAINS"
In overtaking a freight, a passenger train which is x times as fast takes x times as long to pass it as it takes the two trains to pass when going in opposite directions. MAY '08 PUZZLE - "Daylight Savings Downside"
A commuter’s van pool drops him off behind the police station every night at 6 PM, and his wife arrives there at exactly 6 PM to pick him up. On the first day of Daylight Savings Time, however, the man had remembered to turn his clock an hour ahead, but his wife had forgotten completely. Finding himself without a ride (because of his wife’s thinking that it was 5 PM), the commuter started walking home. His wife came across him walking down the road some time later, and picked him up for the ride back home. The commuter’s wife ended up getting back home eight minutes earlier than she had expected. The May Bonus: How long was the man’s walk before his wife picked him up? APRIL '08 PUZZLE - "JACKS OF THREE TRADES"
The MegaGenomics Corporation placed a want ad for a position requiring knowledge of biology, mathematics and computer science. Of the 60 respondents who submitted applications, 46 had training in biology, 40 had training in mathematics, 43 had training in computer science, and 10 had no training in either biology, mathematics or computer science. There are three times as many applicants with mathematics-only backgrounds as with computer-science-only backgrounds; and, there are twice as many applicants with biology-only backgrounds as with computer-science-only backgrounds. The April Bonus: How many of the applicants had undergone training in all three fields? MARCH '08 PUZZLE - "CORDIALITY BEFORE CORDIALS"
A party of three couples (Ben and Alice being one couple) enters a room and shakes hands based on these conditions: a) Once you shake a person's hand, you do not shake with that person again. b) Couples do not shake hands with each other. Alice asked each person how many hands he/she shook, and everyone gave her a different answer. The March Bonus: How many hands did Ben shake? FEBRUARY '08 PUZZLE - "Playing with Fire"
Can you arrange five matches so that each of them touches three and only three others? The matches may touch at any point, but you are not allowed to bend or break them. JANUARY '08 PUZZLE - "The Flower and the Lake"
A long-stemmed flower extends straight up from the bottom of a lake, extending 8 inches above the lake’s surface. A man in a rowboat observes that, when he pulls on the flower, it touches the lake’s surface at a distance of 20 inches from the stem’s original position. The January Bonus: how deep is the lake? DECEMBER '07 PUZZLE - "The Crazy Clocks"
On the long drive home from a field trip to fabled Shark Tooth Ridge, a paleontologist passenger observes a discrepancy between the car’s digital clock and his cell phone’s digital clock. Both clocks show hours and minutes only. Sometimes the cell phone reads two minutes ahead of the car’s clock, and sometimes it reads just one minute ahead. The December Bonus:If the clocks appear to be two minutes apart for twice as long as they appear to be one minute apart, and assuming both clocks can keep perfect time, what is the actual time difference (in seconds) between the clocks? NOVEMBER '07 PUZZLE - "By The Numbers"
Complete the following sentence: In this sentence, the number of occurrences of 0 is _, of 1 is _, of 2 is _, of 3 is _, of 4 is _, of 5 is _, of 6 is _, of 7 is _, of 8 is _, and of 9 is _. Each blank is to be filled with a numeral of one or more digits, written in decimal notation. The November Bonus: Find two solutions. A large ball and a very small ball are dropped from a height of five feet, as shown. Both balls are perfectly elastic ("bouncy"). When the large ball bounces, it then impacts the small ball, bouncing it upward as shown. 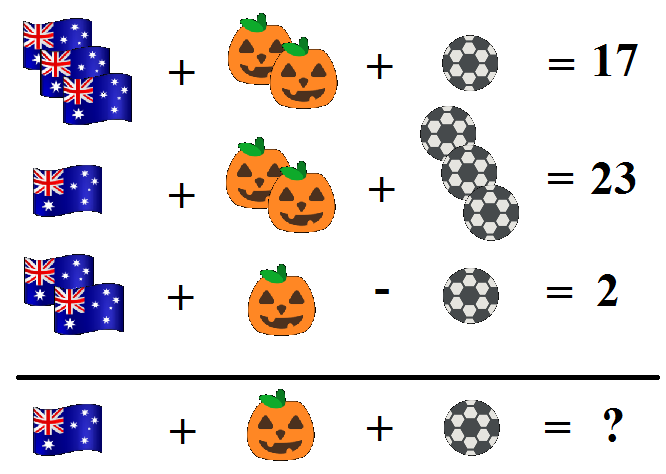 The October Bonus: What is the highest that the small ball can bounce? At what time(s) do the hour, minute, and second hands of a 12-hour clock divide the face into three equal segments, either precisely or as close as possible? Assume a perfectly smooth motion, and answer to within one second. Shown below are two meshing gears marked with arrows pointing toward each other. The larger gear has 181 teeth. How many turns must the smaller gear make before the arrows again point to each other? 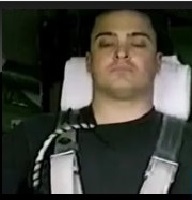 Paranormal investigator George Bradford had worked for months setting up an elaborate blind test of polygraphs. And here he was at last, taking data from four individuals who had all promised to abide by the strict experimental protocols. The first part of the experiment had all four subjects meet in private, where they witnessed one of their number hide a toy bunny. Then, each subject was told to make two statements to polygraph testers (and other observers) about the "incident": one true, and one false. Only later, as the correct answers were revealed, could the researchers see if the polygraph machines used alongside were giving correct answers or not. As the four subjects gave their two statements each, George turned white, as he realized that simple logic would allow the polygraph examiners to decide which statements were True or False, making it very easy for them to cheat. Arnie said: It wasn't me. It was Carl. Betty said: It was Arnie. It wasn't Carl. Carl said: It wasn't Betty. It wasn't Debbie. Debbie said: It wasn't Carl. It was me! (A) Which are lies, and which are true? (B) Who hid the bunny? (A) Replace each digit with a different digit to make another correct addition problem; no digit may replace itself. Its a Numerical Cipher! (B) Can you replace each digit with a letter to spell the names of four of the United States? The following puzzle is from "The Surprise Attack in Mathematical Problems", by L.A.Graham. Only the words have been changed. Three digits, a,b,and c have been used to form the three digit numbers abc, bca, and cab, which have then been multiplied to make a 9-digit product. The number 234,235,286 is not the product, but 6 is in the proper place and the other digits are disordered. The May Bonus: What is the Product? Derek bicycles from Abercrombie to Fitch for a one o'clock appointment. After pedalling at a steady rate for 42 kilometers, he increases his speed by 3 km/hr and arrives at precisely 1:00. If he hadn't increased his speed he would have been 18 minutes late, and if he had made the whole trip at the greater speed he would have arrived, exhausted, 42 minutes early. The April Bonus: What time did Derek leave Abercrombie? Alice and Bob each have a collection of coins. Alice has one more coin than Bob. Alice tosses all of her coins in the air, and counts how many come up heads. Then Bob does the same with his coins. The March Bonus: Assuming all coins are fair coins, what is the probability that Alice will produce more heads with her coin toss than Bob does with his coin toss? In the family of Steve and Sally Starling, each boy has twice as many brothers as sisters, while each girl has three times as many brothers as sisters. The February Bonus: How many Starling Siblings are there?. In the carnival game called Chuck-a-Luck, the player bets on a number, one through six. Three dice are then rolled and if the player's number comes up once, he receives his original bet, for instance a dollar, plus another dollar. If his number comes up two or three times, he receives his original bet plus another two or three dollars. The smooth-talking game operator suggests that since the chance of the chosen number showing up on any die is one out of six, the player has a fifty-fifty chance of getting his number at least once on the three dice, and the payoffs of two or three dollars make the odds to the player's advantage. But really, how much does the player stand to win or lose on an average bet of one dollar? DECEMBER '06 PUZZLE - "Grazing Grass by the Numbers!" A grassland can support 63 sheep for 5 days; or, 22 cows for 9 days; or, 16 cows and 5 sheep indefinitely. The grass grows at a constant rate per unit time in the grassland. Three friends Pedro, Quentin and Rhett jointly hire the grassland for $6930. They agree that the share of rent paid by any given friend would be determined in accordance with the total amount of grass consumed by his pets. Pedro grazes 9 cows and 16 sheep for a period of 20 days; Quentin grazes 10 cows and 3 sheep for 28 days and, Rhett grazes 6 cows and 13 sheep for 27 days. The December Bonus: Determine the respective share of rent payable by Pedro, Quentin and Rhett on the grassland from the information inclusive of the foregoing statements. NOVEMBER '06 PUZZLE - "Squaring,Cubing,Ten Digits -Oh My!" The square and the cube of a certain whole number can be written using each of the ten digits, 0 through 9, exactly once. The November Bonus: What is that certain number? OCTOBER '06 PUZZLE - "Starting the Election Party"
It is Election Night, and candidate Bill E. Bob is pacing around election headquarters. With 60% of precincts reporting, Bob is leading with 60% of the vote. (a) If only half of the remaining voters (40% of precincts) vote for Bob, will he win? (b) At what percentage of precincts reporting will Bill E. Bob be justified in popping the cork off of a champagne bottle? SEPTEMBER '06 PUZZLE - "FAIR TOSSES"
Alice and Bob toss a fair coin alternately to play a game where the first to toss "heads" immediately after the other tosses a "tail" wins. Alice tosses first. AUGUST '06 PUZZLE - "THE PIRATE CHEST"
You have been captured by Pirates while sailing the Carribean, and have been brought before their gruff Captain. With a sinister snarl, he barks "I've a chest here that holds 120 pounds of pure gold coins. Some of these coins be decloons [10 ounces each], and the rest be triploons [three ounces each]. Now, mate, if ye can tell me exactly how many decloons and triploons are in my chest, ye walks away a free man. Get it wrong, and ye'll be walkin' the Plank!" 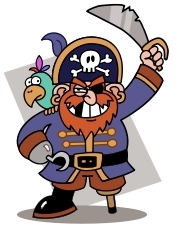 After another pirate suggested that the riddle was perhaps overly challenging, the Captain snorted, and then offered a hint: "Awright, matey - the number of decloons times the number of triploons couldn't be larger!" The August Bonus: For your life - how many decloons and how many triploons are in the chest? JULY '06 PUZZLE - "THE LAW OF AVERAGES "
In a race along a two-kilometer-long track, you are required to travel the first kilometer at an average speed of 20 km/hour. The July Bonus: (A) How fast must you travel on the second kilometer of track to achieve an overall average speed of 30 km/hour? (What's your off-the-hip estimate? And your Final Answer?) (B) How fast must you travel on the second kilometer of track to achieve an overall average speed of 40 km/hour? (C) What have you learned, Grasshopper, about trying to average ratios? JUNE '06 PUZZLE - "TOUCHED BY A TEN-FOOT POLE "
Mathematicians have shown that the following problem is workable, even though it looks like more information might be necessary. Knowing that it's workable makes it much easier to find the numerical answer. A ten-foot pole floats in a large swimming pool shaped approximately as shown in the sketch below. As the pole makes one circuit around the pool (BLACK boundary), both ends of the pole bump continuously against the wall. During this circuit, point P on the pole, six feet from one end, traces out the smaller area labelled A (RED boundary). HOW MUCH SMALLER than the pool, in square feet, is area A? MAY '06 PUZZLE - "Mr. Auber and Mr. Benatar "
The Identification (ID) Numbers allotted to Mr. Auber and Mr. Benatar are such that the numerical magnitude of the ID number allotted to Mr. Benatar is greater by 10 than the numerical magnitude of the ID number allotted to Mr. Auber. None of the two ID numbers contained any leading zeroes. A mutual acquaintance, Mr. Cavalli , who is aware of the above facts ( but doesn't know the actual ID numbers of the two gentlemen), queried Mr. Auber and Mr. Benatar in turn about the sum of the digits in their ID Numbers. The responses elicited by him were respectively 44 and 27. At this point, Mr. Cavalli requested Mr. Auber and Mr. Benatar give some additional information. Both gentlemen answered with a new question: "What are the smallest possible values for the two ID numbers?" Thereafter, Mr. Cavalli was able to ascertain precisely the ID numbers of Mr. Auber and Mr. Benatar. Then, The ID # of Mr. Auber = ? 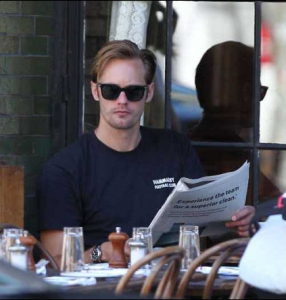 and, The ID # of Mr.Benatar = ? APRIL '06 PUZZLE - "CIPHER ADDITION..."
Here's an addition cryptarithm sent in by Ken Lynch. Difficult as it is to solve, composing it seems close to a miracle. MARCH '06 PUZZLE - "The Race of the Weights..."
Weight-driven grandfather clocks use two weights. One drives the pendulum and causes the hands to turn, the other supplies power when the clock strikes either the hour or the half-hour. 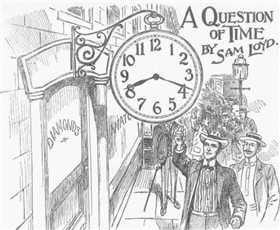 Problem #20 in L. A. Graham's "Ingenious Mathematical Problems and Methods" reads, "A weight-driven clock, striking the hour, and a single stroke for the half hour, is wound at 10:15 P.M. by pulling up both weights until they are exactly even at the top. Twelve hours later, the weights are again exactly even, but lowered 720 mm. What is the greatest distance they separated during the interval?" FEBRUARY '06 PUZZLE - "My Candle Burns at One End..."
Two identical candles are lighted at the same time. One will burn out in five hours, the other in eight hours. How long will it be before one is 2.2 times the length of the other, if (a) identical means the candles burn at the same rate, and start out having different lengths, AND (b) identical means the candles start out having the same lengths, and burn at different rates? JANUARY '06 PUZZLE - "SCALING UP"
A brilliant but warped scientist is persuaded to help a Hollywood mogul make a "King Kong" sequel, not by creating a giant ape, but by developing miniature humans, just one-hundredth their normal height. Designers have crafted a one-hundredth-scale set for the tiny humans to interact with a normal, life-sized gorilla. The January Bonus (Warning - SPOILER!!) In Kong's fall from the scaled-down Empire State building, how many times faster than normal should the film be shot to give Kong a proper-looking plummeting rate? DECEMBER '05 PUZZLE - "CAPACITY"
Paul lives in Española, where the price of gasoline is $2.50 per gallon. There is a gas station near Albuquerque, 75 miles from Paul's house, which sells gas at $2.00 per gallon; his truck gets 30 miles per gallon. Paul schemes to save money by buying gas at the cheaper station in Albuquerque, and then cruising around his Española home. The December Bonus: What is the minimum number of gallons that Paul's gas tank(s) would have to hold in order for his scheme to be feasible? NOVEMBER '05 PUZZLE - What's Left Behind? A hole six inches long is drilled straight through the center of a solid sphere. The November Bonus: What is the volume of the remaining material? In 1654, Chevalier de Méré approached Blaise Pascal with a question about a gambling game that had been played for hundreds of years. The house would bet even money that a player would roll at least one double-six in 24 rolls of a pair of dice. The October Bonus: Did the house stand to make money on this bet? Mike's age is multiplied by seven if its digits are reversed, and one more digit is inserted. How old is Mike? The September Bonus: How old is Mike? In describing his experiences at a bargain sale, Smith says that half his money was gone in just thirty minutes, so that he was left with as many pennies as he had dollars before, and but half as many dollars as before he had pennies. The August Bonus: Now, how much did Smith spend? New Scientist magazine publishes a new Enigma(math puzzle) each week. In the June 4 issue, the puzzle is to find the largest integer whose digits are all different (and do not include 0) that is divisible by each of its individual digits. Thus the number 248 is divisible by 2, 4, and 8 but so is 824 which is larger. The largest such integer is MUCH less than 987,654,321. Next month the solution will show how to cut this problem down to a reasonable size. The July Bonus: What is the largest such integer? There was once a broker of Yeti fur, highly prized for its luxuriant texture. This broker boasted that he took no commissions when either buying or selling the fur. The townsfolk wondered how he could possibly stay in business, but he was apparently quite prosperous. After years had passed, they finally found out the broker's secret -- he was caught using a biased scale. The rigged scale was arranged to be an ounce per pound short when buying, and an ounce per pound heavy when selling. The broker's final transaction involved an amount of Yeti fur that would have given him $30.00 of illicit profit. The June Bonus: How much did the broker spend when buying the fur for his last transaction? The Brownbagg Brewery's signature beer, Bob Brownbagg Barleywine, uses three strains of hops (Bitterbit, Flowergirl and Aromaroma) and three types of barley malt (Pale, Toasted and Burnt). The hops contribute Bitter, Aromatic, and Floral flavor fractions to the "wort" (unfermented beer syrup); the grains contribute color, complex carbohydrates ("unfermentable sugars") and glucose/maltose ("fermentable sugars"). Fermentation converts all the glucose/maltose into alcohol, one kg producing 500 ml of alcohol. The other components are not affected. The May Bonus: How much of each grain type and hop strain must the brewmaster purchase for one 6500 liter batch of Bob Brownbagg Barleywine? World-renowned chemist Dr. Dweeb owned a 12-gallon jug full of sulfuric acid, and another smaller jug. He liked to make up his favorite 25% strength solution (with a quarter of the solution being H2SO4, and the rest good old H2O) with a curious procedure: first, he poured acid from the 12-gallon jug to fill the smaller jug, and then he topped off the big jug with water. After the acid and water had been thoroughly mixed in the big jug, he drew off another small jugful, and again topped off the large jug with more water, arriving at his 25% solution. The April Bonus: What's the capacity of the smaller jug? This month's puzzle might just be harder than it may at first appear! It seems that two brothers from the famous puzzle-solving Answer family, Bobby and Al Answer, were trying out some new hot rod cars on the family's private race-track. Once both racers were up to their respective speeds (Bobby's car was going 120 miles per hour, and Al's was going 95 mph), they crossed the starting mark of the two-mile track just as the gun went off, and then maintained their respective speeds for 24 laps each. The March Bonus: How much time passes until Bobby first catches up to Al? At what position on the two-mile track (relative to the starting mark) does this occur? This month's puzzle is for today's mathematically-minded college frat rats and party-goers. The Kappa Kuppa K'rona fraternity was planning for the Big Bash. Usually, 10 cases of Spud Beer, which is 6 and 1/4 % alcohol by volume, are required for the Bash. (There are four 6-packs per case, and 12 ounces per beer, of course!). This year, however, crafty funds manager George Waldo Busch calculated that they wouldn't need to buy as many cases if they got "Beastie Beer" instead, since that brand has a mind-numbing 15 and 5/8% alcohol by volume. The February Puzzle: How many cases of "Beastie Beer" should Busch Buy for the Big Bash? Fill in the x's with digits.